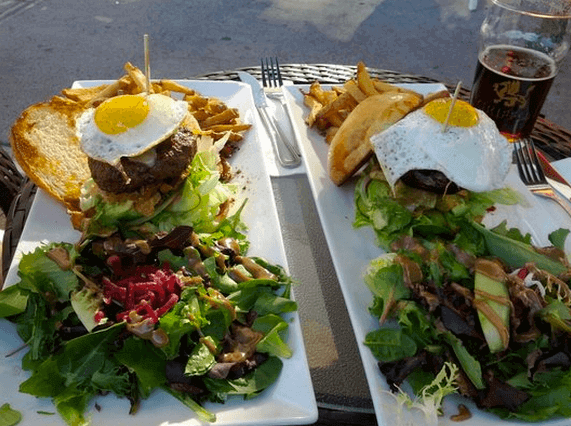 If you don’t know already, Montrealers love their burgers. In fact, the city holds its own people’s choice competition for ‘Burger Week’ each year in search of latest and greatest burger in town – promoting some of the most original gourmet burgers you’ll find anywhere. So in the spirit of that competition, we give you the top five burger joints, each with their own creative take on the traditional comfort dish. As the website claims, you will find burgers here that you won’t find anywhere else. Whether you are in for an artfully created burger, or just want the biggest hearty meal imaginable, ART:brgr delivers the goods. Vegetarians will also be pleased to know that any of the 15-20 burger patty options on the menu can be subbed with a vegetarian option. While it has plenty of options as well as a trendy bar in the middle of Downtown, the famous $100 Burger (easily one of the most expensive on Earth) at M:BRGR deserves first mention. So what do you get for $100?…two Kobe beef patties, bacon, foie gras, honey truffle aioli, and grilled pear with the fig jam. Of course, plenty of less extravagant burgers are available for a normal-size bite to eat, making M:BRGR a must-visit. 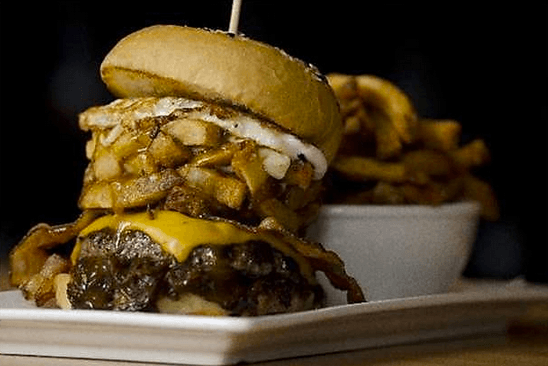 Many patrons will undoubtedly stop Downtown by to enjoy the gigantic ‘Hangover Burger’ – former People’s Choice Award for ‘BEST BURGER IN MONTREAL’ during Burger Week MTL. 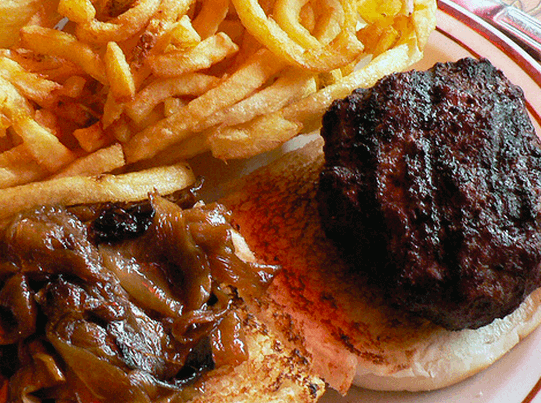 However, the bar offers plenty of gourmet burgers of smaller proportions. Vegetarian options are available as well. For more than 50yrs, Mister Steer has kept Montrealers coming back to the diner-style restaurant on Downtown’s St. Catherine Street, wining numerous awards along the way. While other burger joints shoot for the moon with their burger alchemy, the classic Steerburger has remained a staple of the city by keeping to their own no-nonsense signature recipe. 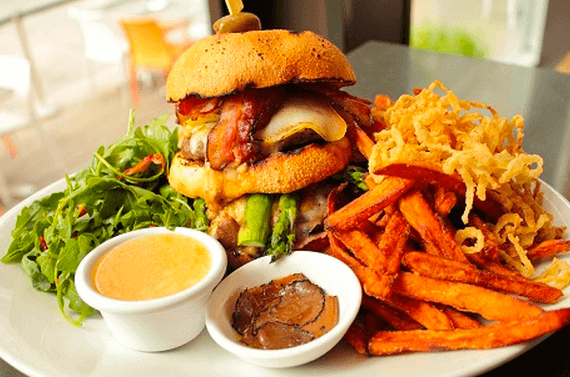 If you are looking to keep the calories down or simply a fan of vegan-friendly burgers made from organic ingredients, Montreal’s most popular vegan restaurant has you covered with 4-5 burger options for less that $15. Try the Tempeh burger, a standby favored by vegans and carnivores alike. And, of course, when you’ve had your fill of the finest burgers that Montreal has to offer, you can count on us to have a comfortable bed to take a nap.